The plot: Rick Wershe is a single father who’s struggling to raise two teenagers during the height of the crack epidemic in 1980s Detroit. He sells guns illegally to make ends meet but soon attracts attention from the FBI. Federal agents convince his 14-year-old son, Richard Wershe Jr., to become an undercover drug informant in exchange for keeping his father out of prison. When the young “White Boy Rick” gets in too deep, he finds himself seduced by the lure of easy money and becomes a drug dealer himself. We’re not saying this isn’t a crazy story, but we would have preferred a different one. 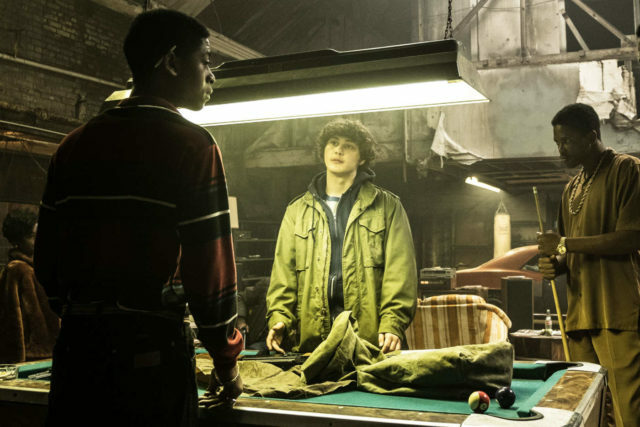 The film is framed in a way that feels like it only wants us to feel sympathy for white boy Rick and the two other white characters who were in the ’80s stage of the War on Drugs that disproportionately targeted, sentenced and hurt African Americans in Detroit and across the country. We think we would have rather had a movie about one of those people because let’s face it—white boy Rick’s is probably not the most compelling drug story about 1980s Detroit. It seems like the movie is trying to make us feel that white boy Rick was unfairly sentenced, which is very Piper Chapman from “Orange is the New Black” of them. If you don’t understand that reference, what we’re trying to say is that it feels wrong to sympathize with a white character who thinks they are “unjustly” in prison when they are surrounded by a large population of people who have systematically been put into prison unfairly for decades (especially when he’s committed the similar drug crimes as many of them). “White Boy Rick” had a lot of hype around it when it was coming out and it almost lived up to it. A lot of the film was as crazy as it claimed to be and there were some really great scenes. Some of our favorites were of a hip-hop skate rink and the ones that featured people like Milwaukee’s IshDARR and Danny Brown. In the movie, IshDARR appears in a pretty major role as “Freaky Steve” Roussell, who in real life was one of Rick Jr.’s right-hand men. He has one of the funniest scenes in the movie where his friends are explaining to him why he wasn’t invited to a wedding because, well his name is Freaky Steve. It was also really exciting to see Danny Brown make a great cameo featuring his wild and distinct laugh. There were a lot of other celebrity appearances, but they’re not exactly worth mentioning here. Overall, it was entertaining enough to make it worth a watch even if the ending falls flat. You can see “White Boy Rick” in Milwaukee theaters now. We’re 88Nine’s Justin Barney and Milwaukee Film’s Kpolly. We’re buds, we like cinema—we’re Cinebuds. This week on the podcast, we’re talking about “White Boy Rick,” the new film based on the true story in ’80s Detroit of a white boy named Rick who went from FBI informant to drug kingpin by the age of 16. Read more and listen to the podcast below to hear our review of “White Boy Rick” and about the two Milwaukee rappers who acted in the movie alongside Matthew McConaughey.